Secrets: Managing Information Assets in the Age of Cyberespionage, by James Pooley, is a very different kettle of fish from the same author's Trade Secrets, an 800-page blockbuster from US publishing house Law Journal Press which is addressed principally to US practitioners, particularly those who find themselves grappling with any number of technical legal and procedural issues when contemplating litigation, portfolio management and transactional issues. 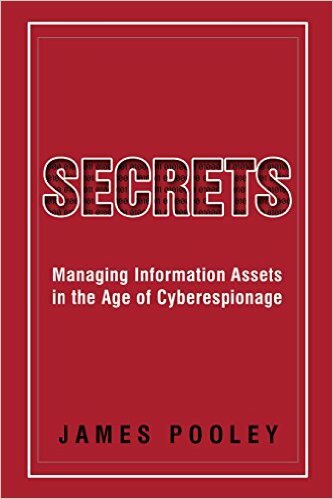 Secrets however is addressed to the people who have secrets at their fingertips, as it were -- people who have to safeguard the confidential information which is at their disposal against prying eyes, accidental spillages, errant employees and ex-employees and other hazards that are daily encountered in business or commerce. Ideally, readers of this book follow the general guidance it contains and minimise their need to meet and instruct the readers of the other book. This is not the author's first foray in writing for the benefit of the lay reader. 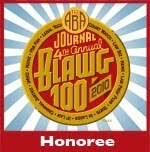 Older readers may recall that, way back in 1982, when dinosaurs roamed the Earth and laptops, tablets and smartphones were still the stuff of science fiction, James hatched Trade Secrets: A Guide To Protecting Proprietary Business Information. In the intervening years, his day-jobs with a leading IP practice and then with the World Intellectual Property Organization, not to mention his teaching activities, have given him a more complete, well-rounded view of a subject that was so poorly served by any sort of literature in the early 1980s. "Information is the business asset of the 21st century. So our impulse may be to guard it. Yet in a flat global economy, we have to share it--not just with employees but also partners, vendors, customers and consultants. Here's the risk: secrets falling into the wrong hands can destroy a project, or even bring down a company. And the same technology that enables seamless communication also makes data theft easy, cheap and hard to detect. So what can managers and business owners do to protect and exploit their competitive advantage, maintain productive relationships, and avoid lawsuits? The books itself is short, in commendably large print, footnote-free and not cluttered by jargon. More spacious margins would have been nice, but everyone likes to make written notes on the printed page. The guidance is clear and direct, as are the appended non-disclosure and consultancy engagement templates. While a US readership is contemplated, much of the advice is law-flavoured common sense, which means that busy business readers can get something out of it whichever jurisdiction they find themselves in. Bibliographic details: paperback. xviii + 286 pages. ISBN 978 0 9963910 0 9. Rupture factor: zero. Available on Amazon here. Biotechnological Inventions and Patentability of Life: The US and European Experience is the second volume in Edward Elgar Publishing's New Directions in Patent Law series. Its existence is owed to funding from the Italian government's Ministry of Education, University and Research. The author is Andrea Stazi (Department of Human Sciences, European University of Rome, Italy). Regular readers who have taken a glance at the cover illustration will need no reminder of this reviewer's antipathy to light bulbs as lazy cliche'd symbols of innovation. 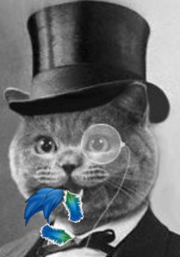 In this instance the light bulb is even less appropriate, since the tome itself deals, as the title indicates, with biotechnological inventions. No-one has however yet succeeded in cloning a light bulb or nurturing a breeding pair of them. However, once past the cover, the book gets better -- as is so often fortunately the case. In today’s technological world, biotechnology is one of the most innovative and highly invested-in industries for research, in the field of science. 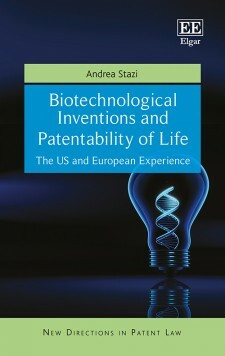 This book analyses the forms and limitations of patent protection recognition for biotechnological inventions, with particular regard to patentability of life. The author expertly compares the United States model, traditionally based on technical evaluations, with the European model, inspired by fundamental rights and bioethics. He highlights how the regulation of biotechnological inventions should guarantee a fair balance between protection of investment and access to information, which is essential for further research and innovation. The problem with this book is the problem faced by its subject-matter. The legal, philosophical, theological and economic literature on both sides of the Atlantic is vast and the author has done a valiant job in trying to identify this literature (largely but not exclusively that which is published in the English language) and make sense of it. However, as is so often the case with books from the same publishing house, there is no stand-alone bibliography; nor is there a table of cases cited or treaties and statutes referred to. Having read, edited and published a number of articles in this interdisciplinary field of scholarship, this reviewer had no means of spotting conveniently whether they were discussed by Andrea Stazi and what sort of opinion was formed in respect of them. The depth of the author's thoughts on the subject can be gauged from the unusual length of the final chapter, bringing together a whole string of conclusions. It is difficult to summarise them since there is a dense weave of interrelation between the conclusions' many strands. The main themes of the author's approach can best be summarised by a string of words beginning with the letter "C": care, consideration, caution, control and cooperation -- but that would be trivialising the journey taken to reach that happy end. Bibliographic details: hardback, vi + 325 pages. Price £85 (online from the publisher, £76.50). ISBN 978 1 78471 589 2. Rupture factor: lowish. Publisher's web page here. On 17 December 2012, following a complex negotiation which lasted 12 years, the European Parliament adopted Regulations (EU) 1257/2012 and 1260/2012 and the text of the Agreement on a Unified Patent Court (UPC Agreement). These instruments institute the ‘European patent with unitary effect’, the first unified system for the protection of inventions within the European Union. The two Regulations will be applicable after the entry into force of the UPC Agreement, which was signed on 19 February 2013 by 24 Member States of the European Union. 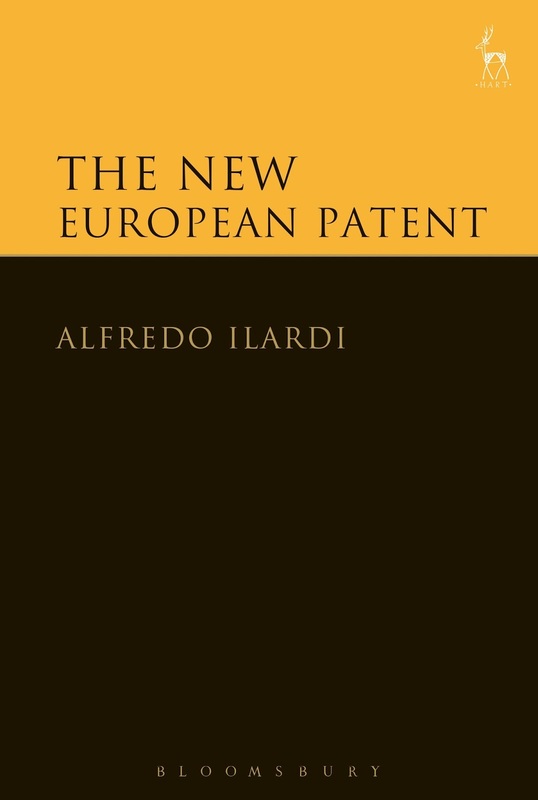 This book traces the evolution of the idea behind the institution of the European patent with unitary effect, including a comparative analysis of the existing parallel regional and international procedures for the protection of inventions. It presents a synthesis of the different phases of the negotiations which led to the adoption of the first unitary patent system within the European Union. In addition it examines the provisions of the two Regulations, of the UPC Agreement and of the jurisdictional system under Brussels I Regulation. Finally, it reproduces in the Appendix the texts of Regulations (EU) 1257 and 1260/2012 and of the UPC Agreement. This introduction gives an accurate flavour of the book: it is full of correctly-recorded official detail and does not venture into the real world of human passion, corporate concern, political expediency and devious diplomacy -- the very stuff of which the "complex negotiation which lasted 12 years" was made. There has been a wealth of academic, scholarly and professional literature on this book's subject matter, not to mention a magnificent concatenation of blogposts in many languages and from many legal and linguistic cultures. None of this can be found here. More than half of this book actually consists of appended materials that can be conveniently downloaded from the internet at no cost at all, which makes the £65 price look a trifle optimistic. Bibliographic details: hardback. ix + 150 pages; ISBN 978184946833. Price £65. Book's web page here.